I wanted to share with you an interesting book I happened to come across recently. It’s called Under the Fountain and it is written by Kathy Lovell and charmingly illustrated by Jane Meech. 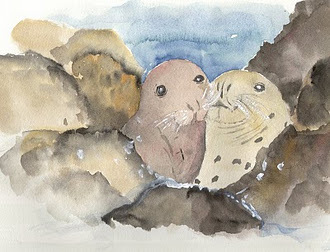 Essentially it is the story of two boys, Jake and George, who discover under the fountain in their local swimming pool a secret passage to the a sea cave where they meet two seals. 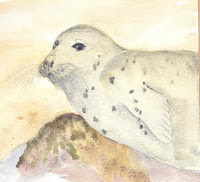 Later in the story they are able to rescue the seals and save their lives. There is also a second plot that describes Jake’s treatment for leukaemia. Why did it capture my imagination? Well for two reasons, basically it is a page turner; once I started I wanted to know what happens to the characters. Secondly, in a past life I was a social worker, and books like this are immeasurably useful for helping children make sense of their illness and the treatment process. When I was working for Social Services it was almost impossible to find books that related to the situations people found themselves in, and a book like this is very welcome. Kathy has a blog: http://underthefountain.blogspot.com/ where you can follow her endeavours to have this book taken up by a major publisher. I must just say a word about the illustrations, I think that Jane Meech has captured both the children and the seals. The artwork is excellent, as I hope you can see from the examples on this post. Under the Fountain is exclusively available from the website http://underthefountain.blogspot.com/. Time is elastic, sometimes, as Bob Dylan once sang: Time is a jet plane, it moves so fast, at other points it seems to crawl. Ok, so far, so clichéd and bland. Perhaps this is because the rhythms of the various parts of our lives are different? Some are fast, for example, Lapwing Publications (http://www.freewebs.com/lapwingpoetry/) are soon to publish my second poetry book. When the first was published six years ago I remember thinking that it had taken me up to that point in my life to write sixty or so pages, yet here I am with another seventy or so being readied for publication. And some are slower. I spent the last weekend writing the third issue of CO2, I have a goal of finishing the scripts-if I can, of the first four issues by the end of the year. I had half completed the script of issue three but was unhappy with the direction and which characters had taken the initiative. This is how I write, half plot driven in that I know where I want to end up and half character driven in that once realised the characters act in certain ways. By Monday afternoon I had completed it to my satisfaction and sent it to the artist. Later in the week I had a meeting with the publisher to discuss timescales. Essentially it will take some time to turn my wordy script into a comic and as CO2 will be produced to the European comic format (that is 48 pages as opposed to the American format of 24 pages) we are looking at publishing one a year. With the zero edition (this is the taster that establishes the name and whets the appetite) being launched at the Cardiff International Comic & Animation Expo (http://www.fantasyevents.org/) the 26/6th February 2012. The first issue will be launched at the following year's Cardiff Expo. This is what I mean when I say different parts of our lives run to different rhythms. Do you have experience of this; do different parts of your life run at different speeds? I am reminded of the record deck of the stereogram we had when I was a child (that’s a stereo record player and a wireless built into something the size of a sideboard - all the rage in the early 1960’s). You could run the turn table at seventy eight, four five or thirty three and a third revolutions per minute to accommodate either an old 78, a single or a long player. This metaphor chimes with me, does it with you? to the British council by the Russian Federal Space Agency to mark the 50th anniversary of Manned Space Flight. 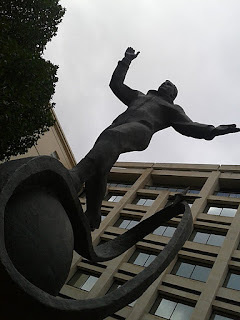 I had heard about the statue via the website Yuri’s Day , which exists to celebrate Yuri Gagarin and the work of Sergei Povlovich Korolev, the great scientist who developed the hardware that took Yuri into space. I wonder if you have to be a certain age to be excited by human’s attempts to go to outer space? I grew up during the Space Race and followed every development, I remember hearing that a human being had circled the planet and safely landed, I was five and I never forgot the name of that man – Yuri Gagarin. I was twelve when he died in a plane crash, thirteen when Armstrong and Aldrin landed on the moon. Now we have turned our backs on the stars and I for one I am sorry that we have. I know there are some questionable aspects to humanity’s journey into outer space, the use of Nazi technology at the outset, the questionable rehabilitation of Werner Von Braun by the Americans, the pollicisation of the whole endeavour during the Cold War, but for all of this-great deeds were done. This is a poem I wrote after the event. A word or two of explanation, I stayed with some friends in London, sleeping in their spare room, which is also where they keep all their vinyl. I spent the night on a futon surrounded by racks of albums. It was very nostalgic, I have to admit I had sold most of mine years before and had forgotten the beauty of acres of LPs. Thirty three and a third years dead today. We have wasted your chance. OK it could be argued that Yuri is standing on the world and the ellipse is the orbit of his space flight, but I prefer to view it as I have written, with the galactic arm holding him. I think it is poetic license, do you ever do that, change events to fit the poem/story? You can find another poem I have written about Yuri on the Yuri’s Day website. It’s an old poem I wrote in the 1980’s. I would also recommend the graphic novel Yuris Day,The Road to the Stars, if like me you are besotted by the idea of humans in outer space. You cannot beat experiencing something yourself before you write about it. Experience will give you a raw material to write about. OK, I am not suggesting you need to experience everything before you can write about it, but aspiring writers are always told to write about what they know, it makes writing easier. When we were in Barcelona recently it was the city’s patron saint celebration and on the Sunday there was the traditional ending of the festival; the Correfoc, when the mouth of Hell opens and devils and dragons cavort through the streets. I had heard of this before but not appreciated the spectacle of it all. I had used the idea of fireworks and the giants (that are paraded on the Saturday) to make the Carnival scene in my novel more exotic. I had wanted a number of things from this scene, I wanted the amplify the spectacle of the real Somerset Carnivals and to underline the otherworldly aspects of the story (it being set in a parallel world), I wanted to give the reader some of the history of the world via the floats and historical characters represented in the carnival parade and I also wanted to move the story along, to entertain. I had the image in my head of the narrator recognising a character across the street in the middle of the carnival parade and him running through the floats and people, then chasing the person through crowded streets (and ultimately fighting him amid the deserted stalls). That Sunday when I watched the devils and dragons parade, spilling fireworks on the observers, I knew that section of the novel would have to be rewritten. I realised that it was too flat, that this experience would enrich that section of the novel. Has anything similar ever happened to you? 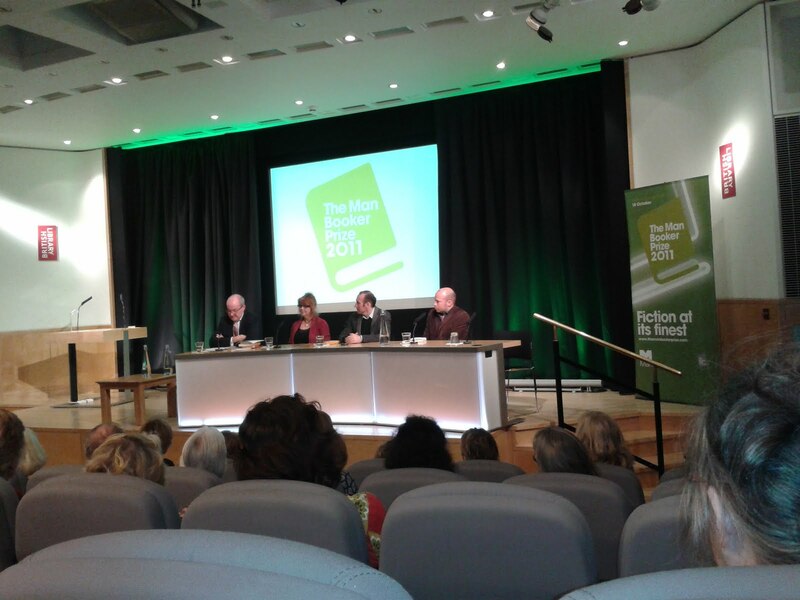 On Tuesday evening I was in London, at the British Library listening to three of the authors in the short list for the Man Booker Prize read from their novels. It was part of the run up to the award ceremony on the 18th of this month. The writers present were Carol Birch, Stephen Kelmen and A D Miller. The event had been organised for book groups and library staff, I had been offered a ticket by my sister-in-law. It was an interesting evening with all three writers reading form their selected novels, interestingly for two of the authors this was their first published work-so there is hope for all of us. I have to say I had not read any of the novels and I found listening to the authors read illuminating in that as they read I decided which one I thought would win the prize. I am writing a special post today about a poem that I was sent after the Purbeck Folk Festival; it was written by the man who inspired Dave’s Henna Tattoo Blues and I am pleased to be able to present it to you. Dave is the one sporting the wonderful tattoo. I met Dave on the Friday night at Purbeck and he told me that he had come to the festival as part of a Stag Party. On the Saturday morning I met the rest of the group and gave them an impromptu recital as we stood near the entrance to the festival. Later that day Dave showed me his tattoo and over the next twelve hours or so I put together a rough version of the poem. On the Sunday I read it to his group and later, as you know, refined the poem and posted it here. The End of the Bloodline. to an alpha mate with an aggressive gait, strangely like your better brother? There is also an MP3 version by his band The Thai Brides, but I appear not to be able to place this in the post-if you would like a copy please email me and I'll gladly send you the MP3. I would be interested in your opinions on the poem and the MP3. I hope to be able to present some other writers who were at Purbeck in the coming months. Today is National Poetry Day which, in my opinion, is enough to warrant a special post. I like the idea that one day a year we celebrate the art of poetry in all it many forms. I usually try to do something on this day and tonight I am taking part in a reading at the local theatre. To hide its contours in pools of thick darkness. I suppose you see your reflection. I change my position in the dips and hollows. Meteors flash as exhausted rock ignites. The night is cold, I turn for the house. This is an old poem, from twelve years ago and for me, it charts distrust (the person watching the narrator stand in the garden expects some form of betrayal by the narrator, who is simply waiting for one of those meteor clouds that the earth periodically passes through to yield shooting stars), breakdown (the fact that the two people are apart, physically and emotionally) and self obsession (the watcher sees her own reflection in the reflected lights as she gazes out on to the garden). At least that is how I see it from this distance. I don’t know how many came to cheer. To wear with a grey tie at Saturday night dances”. They succeeded beyond their dreams. This poem is from1996, Moseley was the head of the British Fascist Movement in the 1930’s, his followers wore black shirts and were known as “blackshirts”. I was talking to my father one night and he told me that Moseley had marched in Widnes and that the men who joined his party simply wanted the shirt, as it was cool to look like George Raft or Jimmy Cagney. As remember the poem wrote itself. Now this relates to the breakup of some friends of mine from university. I wrote pages and pages following a visit when it was apparent they would not last long as a couple, but it distilled itself into seven, very simple lines. Then they are no more. In Barcelona I misheard a friend talking about the drains! I thought the idea of dreams lurking in the daylight was lovely. I shall post more about Barcelona at the weekend.